Vitamin D deficiencies have now been linked to an array of diseases and a greatly increased incidence of cancer. 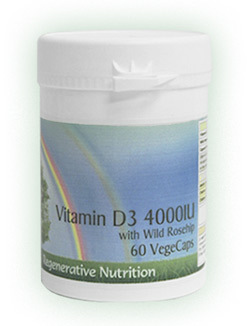 Studies have indicated that mortality from all causes is significantly increased in Vitamin D deficient individuals. Vitamin D deficiencies have now been linked to an array of diseases and a greatly increased incidence of cancer. Daily intakes of vitamin D by adults in the range of 4,000 to 8,000 IU is needed to maintain blood levels of vitamin D metabolites in the range needed to reduce the risk (by about 50%) of several major disorders such as breast cancer, colon cancer, multiple sclerosis and type 1 diabetes. At least 4000IU (8000IU for the first 6 months) a day is recommended. Introducing this will have a general calming, strengthening and healing effect allowing other remedies to work more completely. One can take a broad-spectrum of nutrients and be conscientious about ones diet, but failure to address the need for Vitamin D will result in health problems, and is commonly overlooked. This is especially true for the elderly and people who already have compromised health, who tend not to venture outside much. In the past there were reports of toxicity at higher doses. Further investigation has found that these were for Vitamin D2 (Ergocalciferol). Vitamin D3 (Cholecalciferol) is the form natural to the body. It is not toxic at the recommended doses. In very rare circumstances Vitamin D is contra-indicated in certain auto-immune conditions. If you have an auto-immune condition please ensure that Vitamin D is suitable for you. Vitamin D is required on a daily basis unless you expose at least face and bare arms to the sun, out of doors, when the sun is at least 50 degrees above the horizon, for at least ten minutes each day, without sunscreen. 4 years to 12 years: 1 capsule daily. For children, use proportionally less if Vitamin D is already added to formula feed. Vitamin D is not needed for babies if the mother is breast feeding and obtaining 4000-8000 IU Vitamin D from all sources (Sunlight, Supplementation etc.). The importance of vitamin D is often over-looked. Vitamin D is a hormone like substance that is manufactured in the skin in response to sunlight exposure. Failure to obtain at least a few minutes a day of direct sunlight exposure on the skin will result in a deficiency of Vitamin D. Deficiencies have now been linked to a multiple array of diseases and a greatly increased incidence of cancer. These diseases include arthritis, muscle weakness, multiple sclerosis, and other auto-immune disorders. In fact studies have now indicated that mortality from all causes is significantly increased in Vitamin D deficient individuals. This is not surprising when one considers the multitude of biochemical reactions that cannot complete without Vitamin D. Even the failure to integrate calcium and magnesium, now established to be a result of Vitamin D deficiency, has far reaching implications for health. It is important to note that the sun will not be high enough in the sky to enable sufficient UVB rays to get through to generate Vitamin D in the skin for many months of the year in northern climates such as the UK, Northern USA and Northern Europe. A new study appearing in the journal "Anticancer Research” lays out the simple, powerful truth about vitamin D: A typical adult needs 4,000 - 8,000 IUs of vitamin D each day to prevent cancer, MS and type-1 diabetes. The new research was conducted by scientists at the University of California, San Diego School of Medicine and Creighton University School of Medicine in Omaha. It is groundbreaking research because it establishes the relationship between vitamin D dosage and circulating vitamin D levels in the blood. Vitamin D turns out to be one of the simplest, safest and most affordable ways to prevent degenerative disease. Vitamin D is extremely safe, even when taken in supplement form, because it's a natural vitamin / hormone that the body recognizes. One can take a broad-spectrum of nutrients and be conscientious about ones diet, but failure to address the Vitamin D issue will result in health problems, and is so commonly overlooked. This is especially true of the elderly and people who already have compromised health, who tend not to venture outside much. This problem has been compounded by false information about the actual amount of vitamin D that we need. There have been warnings by health authorities in the past, not to take more than about 800 IU a day, but that level of intake can be obtained from partial exposure to the sun when it is high in the sky for a few minutes. It is an insufficient level to address Vitamin D deficiency. Much research has now found that larger supplemental doses are required to overcome vitamin D deficiency unless 10 minutes of high sun expose on face and arms can be obtained daily. The general advice based on this knowledge, clinical trials, and client experience is to supplement initially with around 4000IU-8000IU per day for 2 to 4 months, thereafter about 4000 IU daily is usually sufficient. Vitamin D is stored in the body, so if you are exposed to strong sunlight without sunscreen for 30 minutes a day for a few weeks then the body will store enough vitamin D to last possibly as long as 2 months. In the past there were reports of toxicity for higher level supplemental Vitamin D usage. Further investigation has found that most or all of these were resultant from the use of Vitamin D2 (Ergocalciferol). Vitamin D3 (Cholecalciferol) is the form natural to the body. It is not toxic at the recommended doses. In very rare cases individuals can be hypersensitive to Vitamin D. This hypersensitivity is usually confined to those with such conditions are sarcoidosis, oat cell carcinoma of the lung, and non–Hodgkin's lymphoma. However, other illness, such as primary hyperparathyroidism, can cause the syndrome. Periodic measurements of 25(OH)D levels and serum calcium will alert the physician to the need to do more tests, such as 1,25(OH)2D3 or PTH. A new study out of Oxford University pinpoints Vitamin D deficiency as a contributory factor in serious illnesses like cancer and autoimmune disorders. According to the report, which was recently published online in the journal Genome Research, genetic receptors throughout the body need adequate Vitamin D levels to prevent these and other serious illnesses from developing. Multiple sclerosis, diabetes, rheumatoid arthritis, Chron's disease, leukemia; these and many more diseases are often linked to a lack of Vitamin D. Your genes literally have receptors that need vitamin D in order to properly express themselves. If there is not enough of the vitamin, serious illness is prone to develop. The Oxford team made specific observations about the importance of Vitamin D in the genome regions associated with autoimmune diseases and cancer, noting that the nutrient is absolutely vital in helping to prevent these diseases from forming. Heart Disease - A Preventative Role for Vitamin D? According to a 2008 study, having low levels of vitamin D is associated with a doubling of the risk of heart attacks in men and an even greater risk of dying from the cardiac condition. The findings, published June 9th in the journal Archives of Internal Medicine, may help shed light on why many people with no known risk factors, such as high blood pressure or smoking, inexplicably develop heart attacks. It also suggests it may be possible to reduce the incidence of the often fatal condition by the use of Vitamin D supplementation. Vitamin D may be beneficial by reducing the build-up of plaque in arteries, one of the causes of heart attacks. Edward Giovannucci, professor of nutrition and epidemiology at the Harvard School of Public Health in Boston. In the study, researchers compared levels of Vitamin D in the blood of subjects. Only 23 per cent of the men had sufficient levels of vitamin D. The researchers learned that 77% of the men had vitamin D levels indicative of vitamin D deficiency. The possible link between vitamin D insufficiency and heart attacks is among a growing number of recent medical observations about the nutrient, which is often dubbed the "sunshine vitamin" because it can be created in people’s skin when exposed to strong ultraviolet light, in addition to being available as a supplement. Although the study doesn’t prove vitamin D caused the reduction in heart attack risk, it is considered by some medical researchers as strong circumstantial evidence of a connection. Thanks in large part to this remarkable research, it's now clear that people in the know are going to up their vitamin D intake to something in the range of 8,000 IUs per day (or more), especially through the winter months. Now that the results of this study are in, it will become common for almost every adult to take 4000 IU/day. This is comfortably under the 10,000 IU/day that the IOM Committee Report considers as the lower limit of risk, and the benefits are substantial. Robert P. Heaney, MD, of Creighton University, an experienced biomedical scientist. You may be surprised to see that we offer recommendations for supplementation of Vitamin D3 for infants. Almost no children under the age of one get enough vitamin D in their diets to meet new guidelines, according to a study conducted by researchers from the U.S. Centers for Disease Control and Prevention and published in the journal Pediatrics. Researchers used a nationwide infant feeding survey conducted between 2005 and 2007 to estimate the average daily vitamin D intake of U.S. infants. They found that only 20 to 37 percent of formula-fed infants were getting the recommended daily 400 IU of vitamin D through their diet. Among breast-fed infants, the number was even lower at 5 to 13 percent. Breast milk is low in vitamin D, perhaps because human infants typically spent large amounts of time outdoors during our evolutionary history. Vitamin D is produced by the skin upon exposure to UVB rays from sunlight, and it is nearly impossible for either children or adults to get enough of the nutrient from diet alone. An infant would have to drink one litre of formula a day, for example, to meet recommendations for vitamin D intake. Fear of skin cancer has led the American Academy of Pediatrics to recommend, however, that children be kept out of the direct sun entirely for the first six months of life, and that they only be allowed in the sun wearing sunscreen or protective clothing beyond that age, thereby making vitamin D synthesis impossible. The only way to reconcile the sun recommendations and the vitamin D recommendations is therefore to suggest vitamin D supplements for nearly all infants. Some doctors have started to question the recommendation to keep all children out of the sun, but Perrine says the guidelines are unlikely to change any time in the near future. Physical examination is usually unremarkable but may reveal undue pain on sternal or tibial pressure if deficiency is severe. The vast majority of cases appear normal on exam, although frequent infections, autoimmune illness, diabetes, cancer, heart disease, major depression, and a host of other "diseases of civilization" may be warning signs that deficiency has been present for many years. The aged may be wheelchair-bound secondary to vitamin D deficiency-induced myopathy, yet they typically recover mobility after treatment. The recent strong association of low mood and cognitive impairment in the aged with vitamin D deficiency suggests depressed mood and/or impaired cognition may be presenting symptoms. A blinded intervention trial found 4,000 IU vitamin D per day improved the mood of endocrinology outpatients, but there are no interventional studies of its effects on cognition. An exposure of 10-15 minutes of full-body summer noon-day sun or artificial UVB radiation (such as tanning beds) will input more than 10,000 IU of vitamin D into the systemic circulation of most light-skinned adults. One or two such exposures per week should maintain 25(OH)D levels in an ideal range, but adequacy should be assured by 25(OH)D blood levels. Those who choose UVB light for vitamin D repletion, from either sunlight or artificial sources, should avoid sunburn, which is associated with malignant melanoma. Furthermore, they should understand that regular UV exposure ages the skin and increases the risk of nonmelanoma skin cancers. Research has shown vitamin K2 and vitamin D3 may provide another level of benefits when taken together. So, vitamin K2 and D3 work together in certain situations to help improve bone health even more. Because vitamin D3 encourages calcium uptake to promote strong and healthy bones, it’s not only a natural complement to vitamin K2, the two nutrients work together to boost bone health to a higher level. The number one food source of Vitamin K is Nattokinase, which is an essential part of our Multi Enzyme Protect formula. A healthy intestinal tract will produce Vitamin K, Primebiotic is our top supplement for the intestinal tract. To read more about Vitamin K, please click here.